We offer a unique blend of MBA level thought leadership mixed with music to develop team performances. A typical session combines substantial input on the theory of teams, the practices of successful (and less successful) teams, practical experiments under safe conditions to develop the necessary attitudes and behaviours and applications where we achieve transfer of the learning to real life. Amongst the clients we have done this for we delivered a suite of team development events for the United Nations Atomic Energy Authority alongside formal strategy development programmes. We have done the work in isolation over a couple of hours for GSK, Kent County Council and some Insurance companies, where the company themselves had already delivered the essential knowledge and just required us to conduct the team development experience. Our approach is completely bespoke to address the subtleties of your team challenge, whether it is about addressing a tough challenge that keeps you awake at night, or purely to achieve greater levels of cohesion, collaboration and co-operation. 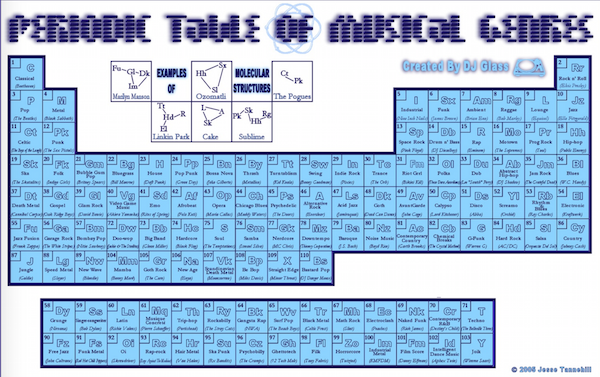 Whatever style you prefer, we can accommodate you, even some of the rarer "elements" on this brilliant Periodic Table of Music by Jesse Tannehill.